I'd like to thank those people who have donated to my legal defense. Your help has been a leg up, but this will be a long climb. Take a moment and share this update if you can. There are others, who have expressed support for me, or admonished the man who has brought this frivilous suit. Your expressions of solidarity and amplification on this issue have provided me with great moral and morale support. Please share this update. Since I have announced this effort, the pace of events has accelerated. Firstly, my lawyer filed a motion, yesterday, to remove this case to the federal district court. We have good legal justification for this and it is part of a strategy that my counsel has mapped out and that I approve of. Secondly, opposing counsel/the plaintiff made what can best be described as utterances against interest. He has threatened to sue one of my supporters, The Huffington Post (which ran a story on this, and Talib Kweli. He has threaten launch this suit Monday. There will be an obvious delay between filing and service.His past threatening statements have been forwarded to the Texas Bar Association and he is no "no longer welcome where he has trained for years" I presume this means the Academy where he studies Brazilian Jiu Jitsu and Judo. This is unsurprising as Brazil is a very multi-racial society and BJJ gyms have no tolerance for that sort of thing. Since the Huffington Post article was mentioned I presume this is what got the attention of his school. 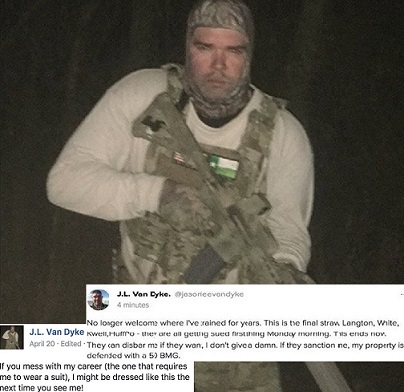 In the same message, he stated that he did not care if he was disbarred and that his property was defended with a 50 BMG. I am not sure if he was the proper paperwork and tax stamp for an actual Browning machine gun or if he is referring to some other weapon chambered in that particular caliber. There are many on the market that require less paperwork, expense and are not fully automatic. But either way we are discussing a large weapon with capabilities at extreme ranges. He referred to his big big gun in a sentence about "sanctions," which I expect would mean sanctions imposed by the Texas bar, which could include fines, and forfeiture should those fines not be paid. Such a forfeiture would be carried out by the local sheriff. 1) A racist group puts up flyers in my city and at the same time other flyers are literally stuffed into people's homes. 2) I write a story about this issue as a local news source should. 4) My news outlet responds with a public editorial telling him NO and exposing his history as a racist activist and some parts of his criminal history. 5) He sues personally for editorial and not for the original story. 6) Talib Kweli exposes his past history of racist threats on twitter. Both that and his lawsuit against me and my publication make national news. The Huffington Post forwards his threats to the Texas bar association for comment. They are not amused. 7) That national news causes him problems. He threatens to sue more people, and if he looses or is punished for his threats of violence, he threatens more violence. This is the core of fascism in action as a political movement. It will use the state where the state is the tool for the job, and it will use violence against society and/or the state if law does not work.